Do You Ground Metal Roofs? Metal roofing is extremely popular in all areas of construction, from entire housing implementation to self-built sheds in the backyard. If you plan on using metal roofing, one thing you may consider is whether you need to ground that roofing as you do in other electrical or metal applications in construction. The short answer is no, you don't have to ground a metal roof, and you will incur no additional risk if you don't ground it in most circumstances. Metal conducts electricity, but when you are dealing with a full roof a lightning strike would ground out through the rest of the structure without causing damage or harm to the interior. And since lightning will strike whatever gives the least resistance as a path to the ground, a metal roof won't pose any greater risk of a lightning strike than a standard roof on the same structure, as the structure provides the path. To further illustrate the fact that grounding a metal roof isn't necessary, there is no building code currently in the National Fire Protection Association's building codes guide that requires a ground on a metal roof. Keep in mind, however, that the lack of a code mandating a ground assumes that other building codes are followed. This includes using only PVC piping to extend from the interior of the house up through the roof. Not following this code and using a metal pipe to extend through an ungrounded metal roof could pose a serious risk to the occupants inside the structure. If lightning were to strike the roof in that case, it would not be grounded through the rest of the structure but could instead travel down the pipe inside the building and cause damage. Additionally, if you have metal objects within a few feet of the roof itself, such as metal structures on a nearby porch, or large yard equipment, you may consider grounding the roof as a safety precaution. A lightning strike in this situation could jump to very close objects in the absence of a ground. So while grounding a metal roof is by no means required or even in most cases necessary, there are a few instances when you might consider doing so just for peace of mind. 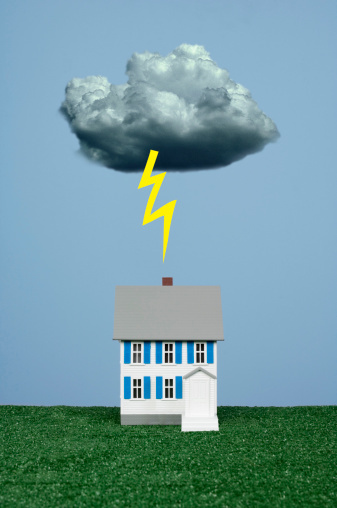 Does a Metal Roof Need a Lightning Rod Attached?